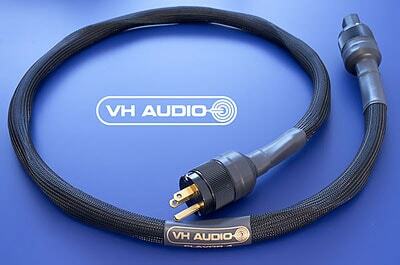 The VH Audio Flavor 4 power cable is designed for higher current amplifiers and CD transports/players. * FOUR 12 AWG low strand count bare copper conductors for very low resistance. This results in 9 AWG for "hot" and 9 AWG for 'neutral". * Ground wire consists of a 10 AWG low strand count bare copper. * Deep Cryogenic treatment of conductors is standard, including the ground wire and the connectors (using standard WattGate connectors). * Star quad geometry with tight lay length (twists per inch) provides excellent RFI/EMI rejection, and also reduces the inductance (raises capacitance). * No shield is utilized in order to maintain unrestricted macro and micro dynamics. The star quad geometry concentrates the current towards the center of the conductor bundle, providing excellent shielding from external sources, as well as mitigating radiation of RFI/EMI. * VH Audio's "Spaced Counter-spiraled Ground"™ geometry, which helps reduce the sonic effects of having a safety ground. * Connectors available include Furutech's FI-11, FI-25, U.K. and Schuko series.